The name and scholarly writings of Ol'ga Mikhailovna Freidenberg (1890 thorugh 1955) remained poorly known in Russia and in the West for a long time, and it is only recently that her life and works have begun to attract the attention of scholars in the Humanities. Experts in Classical studies find in her writings an encouraging approach to the genesis and development of the main aesthetic categories as they progress through culture; literary theorists interpret her methodologies as a highly needed counterpart to Russian and European cultural history and philosophical aesthetics; scholars of folklore and philosophical anthropology appreciate Freidenberg's treatment of the archetypal metaphors that underlay the most archaic perceptions of the world and allowed primeval speaking communities to come out with the fundamentals of their worldviews; and, finally, historians of Russian literary culture and specialists in Russian literature of the 1910 through 1950s are attracted to Ol'ga Mikhailovna Freidenberg's long-term and intensive correspondence with her cousin, Boris Pasternak. In addition, Ol'ga Freidenberg is known as a talented memoirist, the author of the 2,500-page retrospective diary The Race of Life that embraces the time span from her early childhood to 1950 and reads as a testimony of an epoch whose vital forces were crushed by Stalin's tyranny. Freidenberg's professional writings were poorly known in the West due to the lack of translations: for many years the entire bibliography of her works translated into English was limited to four small fragments published in 1977 and 1978. 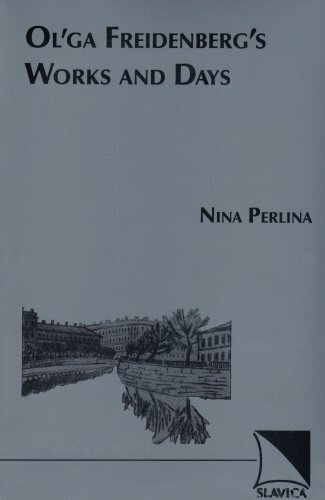 A publication of five of Freidenberg's larger papers by Soviet Studies in Literature (1990 through 1991) and the recent publication of Image and Concept (Freidenberg's last fundamental study, which she completed in 1954) have made it easier to produce and to publish the first critical biography of Ol'ga Mikhailovna Freidenberg. The monograph offers an overview of Freidenberg's scholarship (with partricular emphasis on her seminal studies The Poetics of Plot and Genre, Image and Concept, and her unpublished memoirs The Race of Life). The monograph is an attempt to reintroduce Freidenberg's scholarly views to the symposium of ideas whose protagonists were N. Marr and his Japhetic Theory and Semantic Paleontology; Ernst Cassirer and his theory of knowledge (as it is known from Language and Myth and The Philosophy of Symbolic Forms); the magnificent cohort of Russian Formalists (Iu. Tynianov, V. Propp, K. Bogatyrev); Mikhail Bakhtin with his theory of discourse and interpretation of Carnival Culture; Johan Huizinga with his study of the play element in culture, and, finally, contemporary Russian and Western scholars working in the area of Semiotics of Culture. The monograph addresses a wide range of specialists in cultural studies and scholars studying the genesis of aesthetic categories and their cultural development.